Adventure Game Studio | Games | Potato Head - Sweet Attack! Download Potato Head - Sweet Attack! 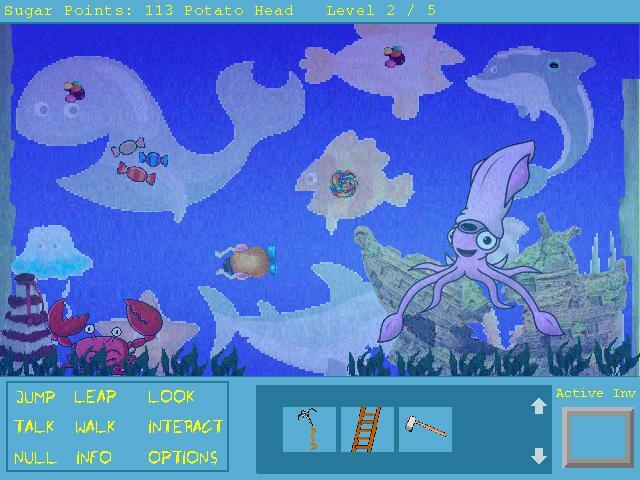 As Potato Head get as many sweets and cakes as you can by jumping, leaping, swimming and using your Inventory items. 5 levels to keep you going for a while. Levels include: * Jumping up to grab sweets * Leaping over gaps * Swimming to get sweet stuff * Cracking open an Alien Sweet Egg * Facing a man-eating Shark! * Meeting a Mermaid * Driving a Moon Buggy * Betting on a Pony race and more.... All this as well as upbeat, cheesy music ;) My thanks to Renodox for he's hardwork in testing and grammar checking. Your comments are most welcomed. A strange combination of platformer and adventure game - in a lot of ways it works. The level of gore seemed at odds with the family-friendly appearance of the game though. Otherwise, an interesting idea that is generally well executed.